Review first posted on Nautical Star Books . 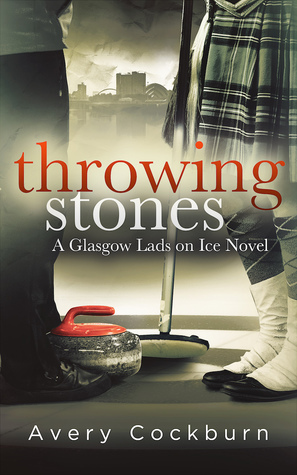 Throwing Stones is the first in a spinoff series related to the Glasgow Lads football/soccer books, but may be read as a stand-alone novel. I have read several of the previous romance books by Avery Cockburn and really enjoyed them. Throwing Stones wasn't my all time favorite but it was still a good story! Oliver is a curling coach who quit playing the game himself amidst a bit of a scandal. He has come to Scotland from Canada to coach Team Boyd to the next level of curling championships. His contract depends on them winning the tournament, which presents a bit of a problem when he starts falling for a guy on another curling team. Oliver has some emotional issues from his past that are still causing him issues. His self esteem is pretty low and he struggles with keeping his focus. Lucas is rather zen and happy go lucky most of the time. He loves curling and rarely lets it stress him out. His brother in law's team is his major rival but they have a good natured relationship and there is no hostility between the two teams. His zen like attitude is challenged when he falls in love with the coach on his brother in law's team. There are several well written secondary characters, as well as a few people from the Glasgow Lads football/soccer books that make an appearance. It was nice reconnecting with them. Basically, this curling romance book is all about... curling! Every chapter starts with a definition used in the sport. There is lots of explanation of the strategy and history, which I found fascinating. If this isn't your thing, you might find it a bit dull, but I enjoyed the amount of work that the author clearly put into the research of this sport. You have two teams that are intertwined by friendship and family. There is a tournament that means a decent amount of money and the winner moves on to bigger and better things. This creates a bit of strife, however, the players all take it in stride and focus on the game. So, there is not a lot of heat in this curling romance book, but it is such a sweet relationship that I didn't miss it TOO much. I did though, just a little. There is a bit of heat...mostly some kissing and a few things are glossed over. I think these guys would have really got on together quite amazingly and really was bummed that the author didn't give us just a bit more heat. The development of the relationship between Luca and Oliver is sweet and well paced. They really connect emotionally as Oliver struggles to come to grips with his past issues. Luca has a few of his own issues that he opens up to with Oliver and by the end, these guys are really deeply connected. So, the romance is mostly an emotional bonding with a very low heat level. So, Oliver's reason for leaving curling behind as a player was not, in my mind, as big a scandal as it was made out to be. This is a bit of a spoiler here but basically it turned out to be nothing more than a paperwork error. I didn't quite feel like it would have descended into the scandal that was described but I am not well versed on the ins and outs of sports scandals so maybe it would have. Overall, I really enjoyed this curling romance book by Avery Cockburn. The characters were sweet, I loved learning about curling, and there wasn't too much drama to detract from the development of the story. The lack of heat and thinking that Oliver's curling scandal was a bit overdone detracted a bit from my overall review. Throwing Stones was well written, however, and I did enjoy it quite a bit. Sign into Goodreads to see if any of your friends have read Throwing Stones.